Whitestone Vitamin & Health Center is your destination for a full line of vitamins, supplements and personal care products, designed to help you maximize your wellness and quality of life. We carry a huge range of proven products and our staff takes the time to consult with you about the different facets of your wellness that you want to improve. Stop in today—we’re always happy to assist! Do you wake up and go through the day feeling lethargic? Is the stress of daily life compounding on your shoulders, weighing you down? Are you tired of personal care products that irritate your skin and hair, and leave you feeling dry and calloused? It’s time to visit Whitestone Vitamin & Health Center, where you’ll find a full range of products, meant to help you look and feel your best! 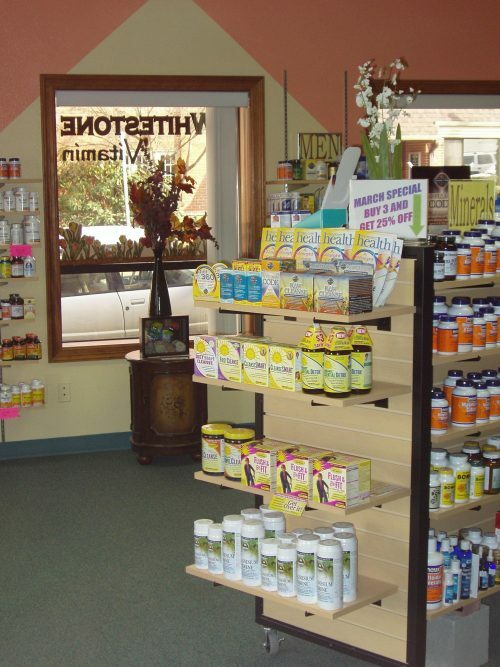 Our vitamin and supplement store in Douglas County, OR is your destination for healthful dietary supplements, essential oils, herbs, natural care products, organic foods and much, much more. We only carry products designed to boost your quality of life. Unlike other retailers, our vitamin store in Douglas County, OR isn’t here to push products that you don’t need in order to make a commission. Instead, we take the time to sit down with you to learn more about your lifestyle and wellness. From there, we recommend only products that will benefit you—and we’re never pushy about what you should or shouldn’t use! We even have a reference section right in the store, where you can sit down and read up on the foods, supplements and other products we offer. We encourage our customers to learn about the items we have to offer. We promise you’ll find something that helps you unlock a new potential for wellness, happiness and quality of life. Our staff takes the time to consult with you about specific products that might provide benefit to your quality of life. We have monthly discounts available, which include 15% off NOW products and discounts for senior citizens. We’ve been in business for more than a decade, with expertise and experience encompassing everything we sell. Our business is family-owned and –operated, with a strong emphasis on customer service and satisfaction. Stop on by today for a personal consultation and recommendations! With the right combination of vitamins and supplements, you could be living a happier, healthier life each and every day. Stop by today to learn more about the many products we sell. September 5, 2017 Renee S.
"Whitestone vitamin is the best place ever! the girls are so friendly and knowledgeable." July 5, 2017 Kylee P.
"Very knowledgeable and helpful! They have a wide variety of products and fair prices!"